Note the "adhesive pads" they use to walk on smooth surafces such as glass. Very nice work! I agree on #4. What were your optics? Objectives used were probably Amscope generic objectives. As I have written before, many of the current Amscope objectives are of fairly good quality that I have found with my tests using a micrometer slide to test for chromatic abberration, contrast and field flatness. Often times, the image quality of the Amscopes have surpassed the performance of older Olympus 160mm tube lenght optics in this regard. The older Olympus optics may have been acceptable for visual observation, but do not measure up to current "generic" optics. I have an almost complete set of NFK oculars, and I still find the design of even the most modest objectives to have very good performance. #1 and #3 were shot in normal brightfield (no UGF) with the Amscope Plan 4x NA 0.10 160/017 and stacked in Zerene. The cover slip was a .22mm slip and the specimens were mounted in Canada Balsam. Since my bottle of balsam is aging as I do, it is slightly yellow and the yellow has to be taken out in Photoshop. #2 and #4 were shot with a 10x 0.25 NA 160/0.17 again mounted in Canada Balsam. They are Zerene Stacks stitched together in Microsoft ICE. #2 was five stacks stitched together and #4 was four stacks stitched together. 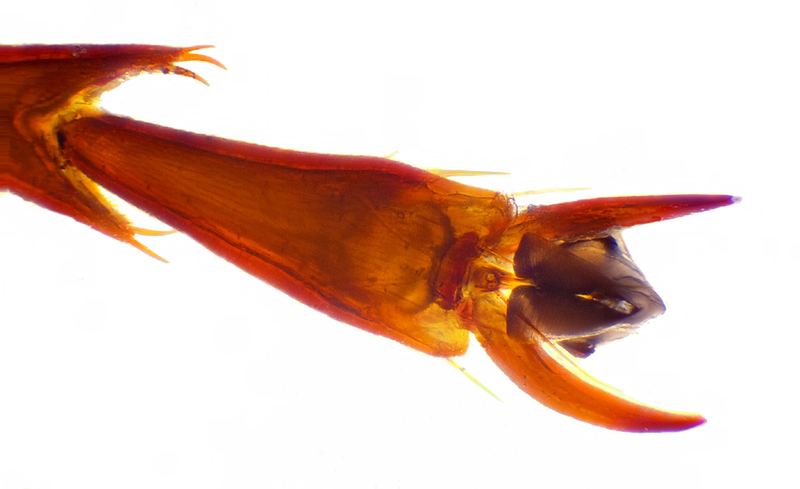 I you use the entire leg, the specimen will almost always be a side view. If you make your cut just below the tibia and tarsus, there is a greater likelihood of getting a top view, as seen in the images I presented. 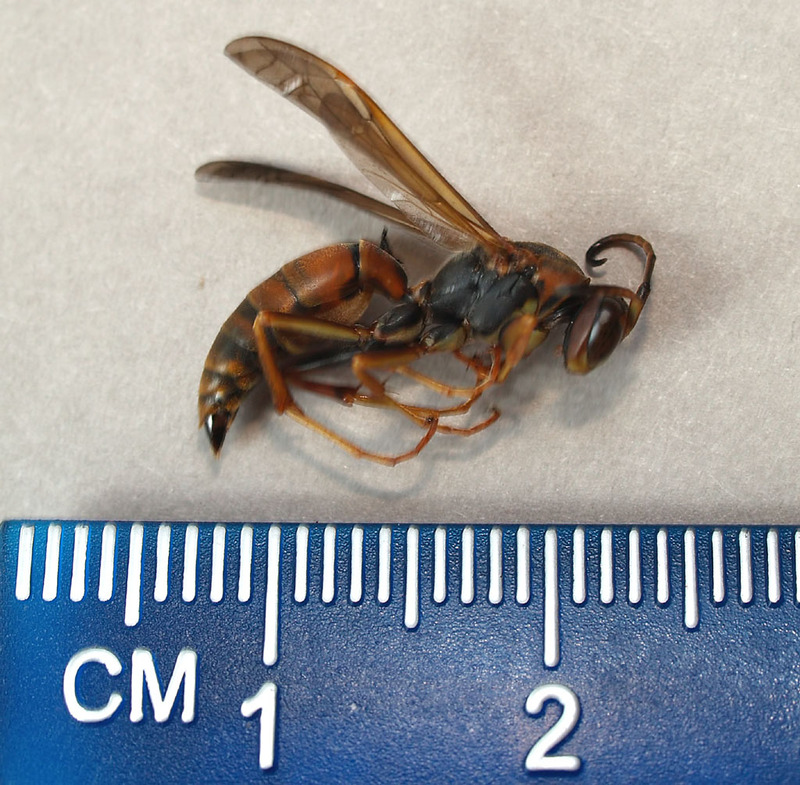 As for the species ID, we have been plagued by this species of wasp all summer long in our home office. I finally found the nest, which was in some wainscotting near the ceiling of our office. I nuked it with wasp killer and plastered the openeing shut, but we still get three or four a day, which have blessed me with predictive behavior. They usually congregate at one window, and I toast them with a propane lighter. To get the feet used in the images in this article, I gassed them with ether to have an intact specimen. Aerosol ether can be purchased at any automobile parts stores as "cold weather" starter. Plus, the sprayor gets a pleasant buzz. I like the images and greatly appreciate the discussion of technique. I have some concerns about the identification, however. According to Google search, you're the only person on the internet who has ever used this spelling. At this moment, that search gives literally "1 result", and it's this thread. So, I'm suspecting a typo. Did you perhaps intend Podium luctuosum, as in Kaufmann Field Guide to Insects of North America, pages 334-335? As for the species ID, we have been plagued by this species of wasp all summer long in our home office. I finally found the nest, which was in some wainscotting near the ceiling of our office. I nuked it with wasp killer and plastered the openeing shut, but we still get three or four a day, which have blessed me with predictive behavior. It provides paralyzed roaches for the larvae in mud covered cells under bark flaps or pre-existing cavities in wood. "Solitary Wasps: Behavior and Natural History" by Kevin M. O'Neill just notes Podium as being a genus in which "female modifies preexisting cavity". What's the basis for your identification? The Kaufman Field Guide to Insects. I haven't found any other images to match. I'll see if I can an intact specimen to post. God knows we have enough of them in our office. The Kaufman Field Guide to Insects. I haven't found any other images to match. Matching images in Kaufman's guide, or any other resource for that matter, almost guarantees that the ID will not be correct at the species level. Frequently that process will not give the right genus, and sometimes not even the right family. 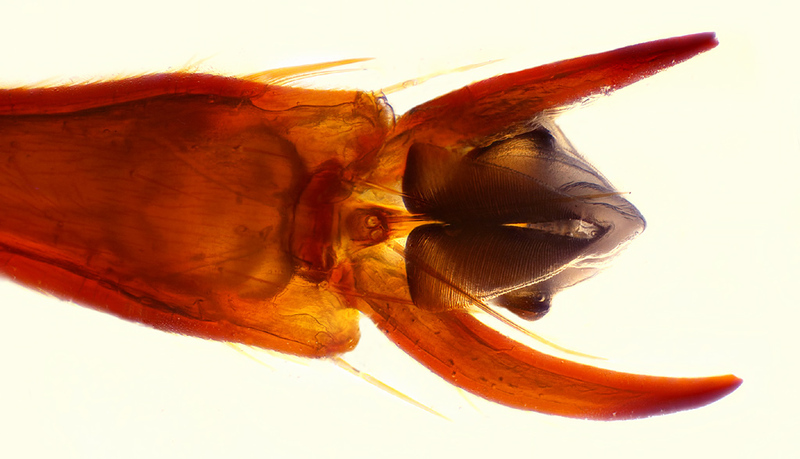 Remember the "Helophilus flower fly" that turned out to be a sarcophagid? At this point, I think what we really know is that you have a problem with some unidentified black wasps in your office. 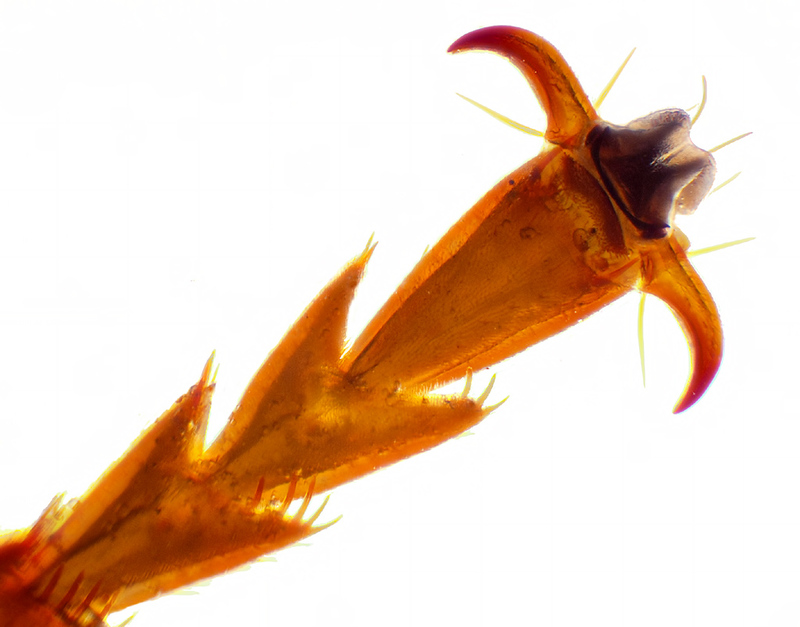 What's shown in this thread are some excellent pictures of the feet of those unidentified wasps. Nothing is added, and quite frankly a lot is subtracted, by trying to give a scientific name and failing in the attempt. There is no shame in saying "unidentified". Very nice, especially the last one ! Ah, so it's not even black! I have no hands-on experience with eastern wasps, but from your description and this appearance I'm thinking this is one of the Polistes paper wasps. There are several species, with quite variable appearance. Most of them are striped black and yellow, but there are also uniform brown forms like you're showing here. 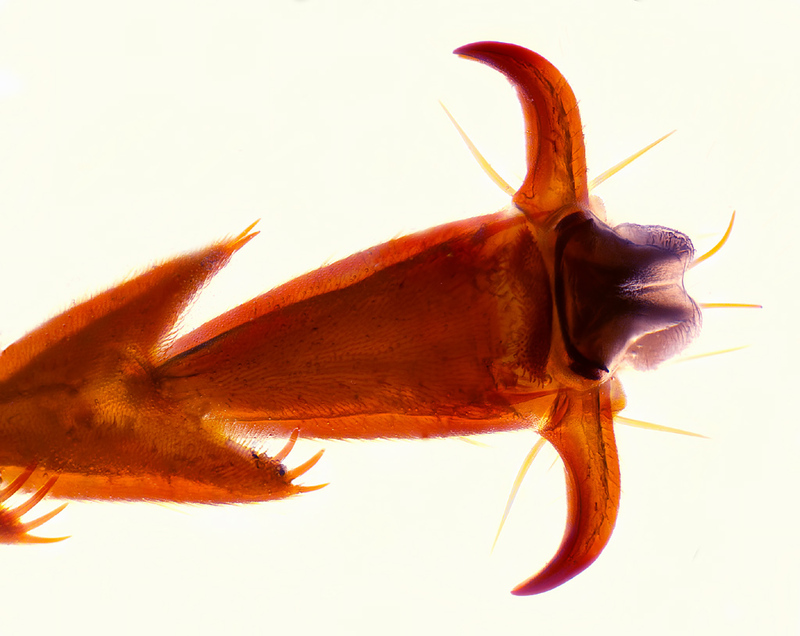 Based on general appearance and a priori odds, I would place a very small bet on P. fuscatus, the brown form as shown at http://bugguide.net/node/view/633924/bgimage and in figure B10.56 at http://cjai.biologicalsurvey.ca/bmc_05/key_polistes.html. Note that in Kaufman, P. fuscatus is shown as a vivid black-and-yellow form, rather like figure B10.55 in the biologicalsurvey key. Interestingly, both the black & yellow form at B10.55 and the brown form at B10.56 are described as simply "P. fuscatus, female". So the color difference is not even a matter of male versus female. Clearly overall color is not much good for identification. If you look up in the technical key near the top of http://cjai.biologicalsurvey.ca/bmc_05/key_polistes.html, you'll see that the colors of specific bits of anatomy are mentioned, but finding those bits based on their unintelligible names is itself quite a challenge. I can't do it without repeated reference to a "map of the wasp", and even then I probably get it wrong pretty often. Shoot, for all I know this isn't even a Polistes! But it's definitely not a Podium luctuosum -- wrong anatomy, wrong habits.